How was your week and weekend? Did you make it to any special destinations? For those of us in Seattle living along the Sound, this past week was full of wooly mornings marked by the bellow of fog horns, distant ghost ships, and crystalline webs hanging heavy with dew, strung from every tree or window–and just when you felt like fall was wrapping around, the fog would open to a searing blue sky, and roll away to reveal 70 degree days and some balmy nights! It was a slow moving week with some unexpected turns, but I am happy to say that I completed one long overdue card and played around with some ideas for upcoming card designs. So let me pick up the speed here, as it’s nearly bedtime in my corner of the world! This card has been in the works since July! The necessary items were purchased, idea sketched out, and some layout completed, but it finally came together this weekend. As I said in my “Getting to Know Me” post, my cards are often designed with the recipient in mind and that is true of this card. Overall, I am pretty happy with the finished product, particularly how my inlaid street sign and road paper panel turned out. 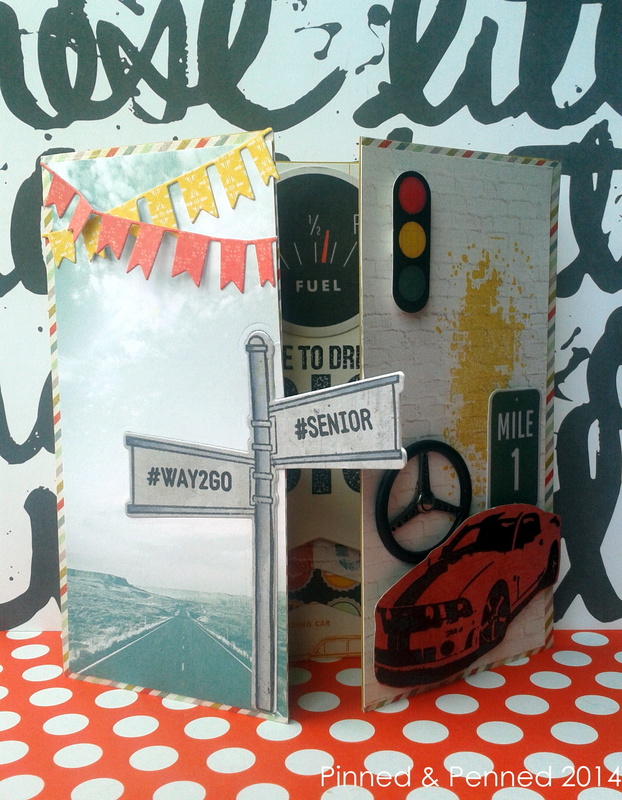 The card features nearly all Crate Paper Road Trip papers and embellishments. I will apologize ahead of time for the quality of some of the photos; I made some changes to the card and had to retake in different light, so they are a bit washed out! My original idea, when I saw that blue highway paper in the pack, was to inlay the Neat and Tangled “On the Corner” sign post. 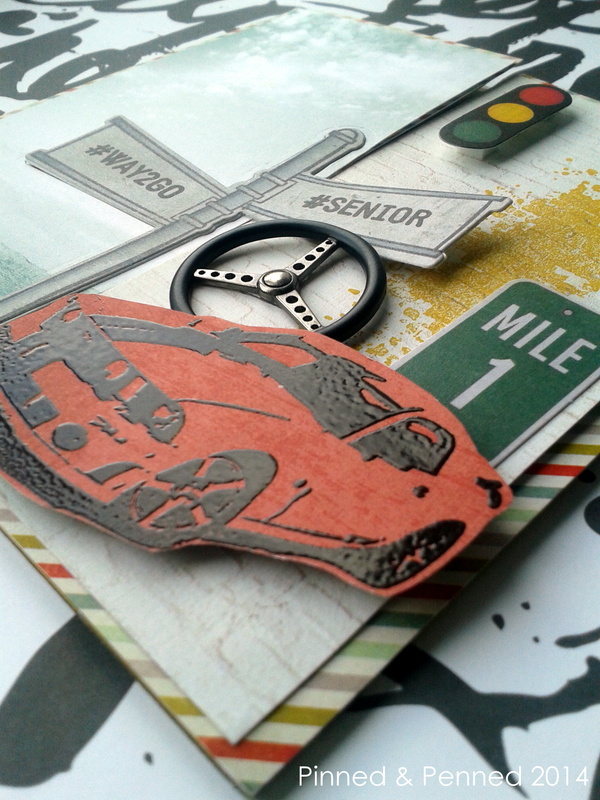 I wanted the post to be 3-D and act as a closure for the card; as you can see it tucks into the Prima Car Parts steering wheel. I cut the sign out of some grungy gray paper, and then used Copics to enhance the outlined areas. 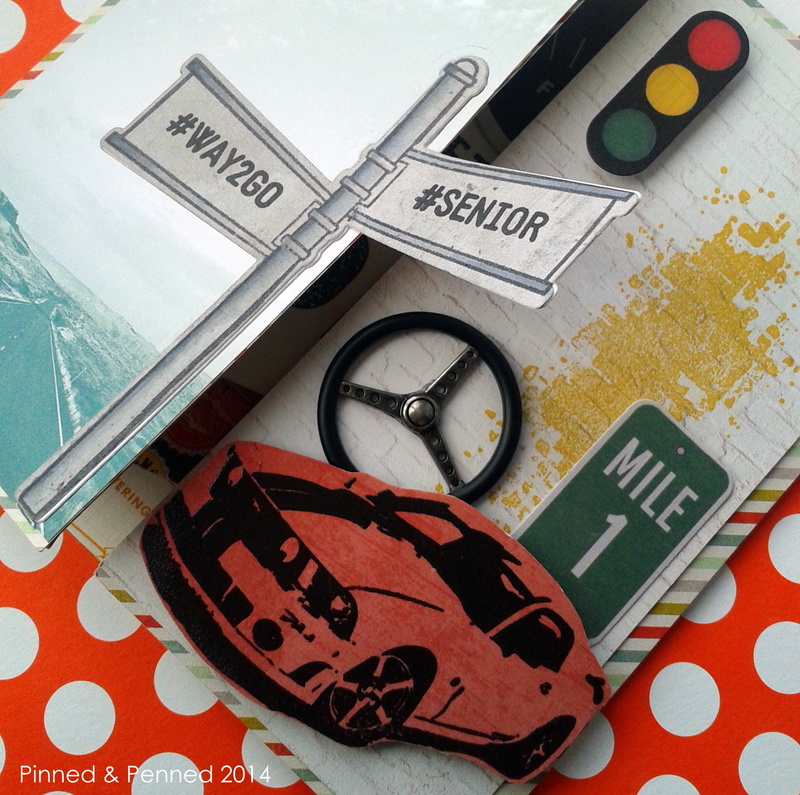 Instead of using the corresponding Neat and Tangled stamps, I opted for my graduation themed stamps from MFT. 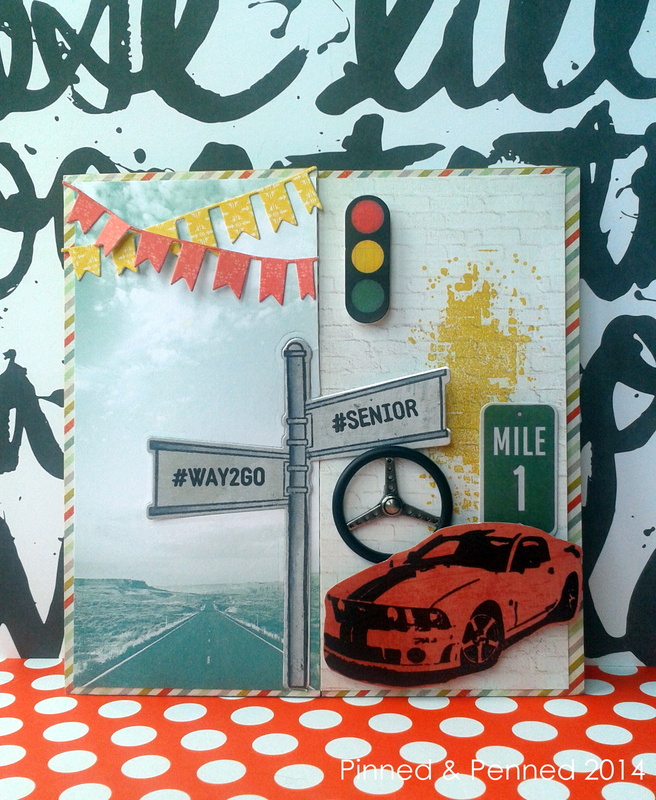 I did have to focus on measurements for this card as there were numerous panels and layers to fit together! It measures 5.5″ x 5.5″. I do like how it looks when it sits open to reveal of view of the inside. 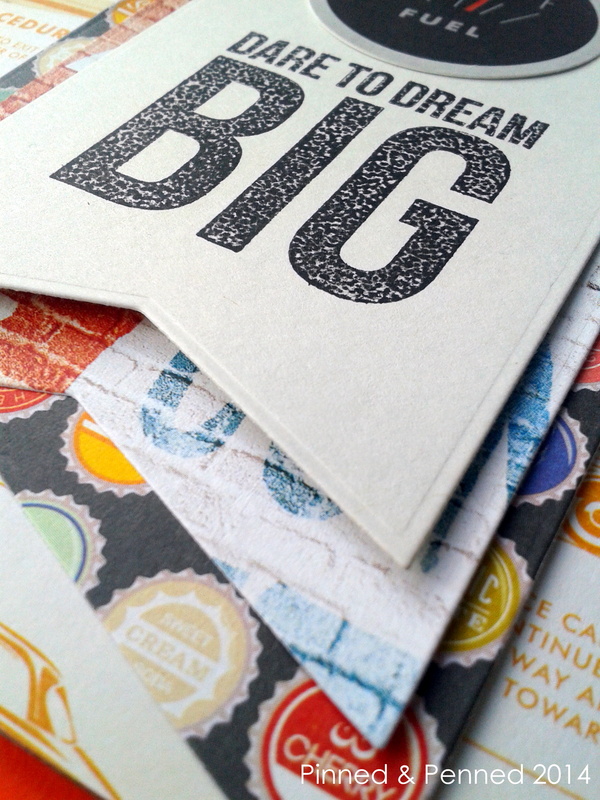 I used MFT Wide Banners for the flags inside; the sentiment is from Kaisercraft. It’s not the highest quality photopolymer stamp, and even after seasoning the stamp and stamping it multiple times, the ink still balls up a bit, so you get a mottled look, which I actually really like for the feel of this car. Kind of like oil drops on the ground, tire treads, or highway gravel! 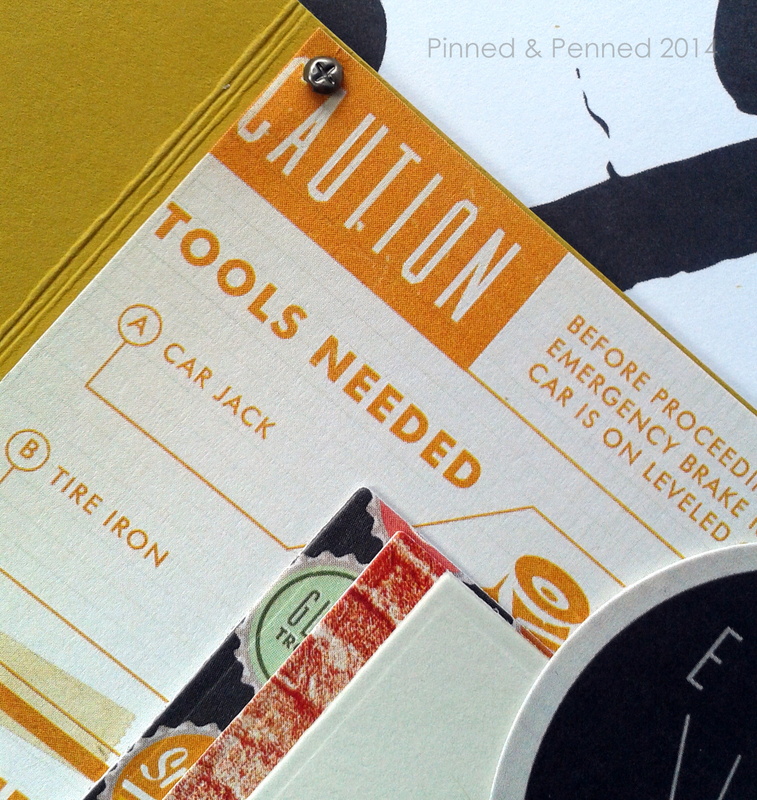 I love these tiny Tim Holtz screws I used to adhere the main panel, along with some glue dots. The Mustang stamp is from Deep Red Stamps; it was stamped on some grungy red paper from the Shine collection from We R Memory Keepers and heat embossed. I then fussy cut it. I used a grunge stamp from Impression Obsession for the mustard yellow wall splatter. What I really wished I had for this panel were graffiti font stamps and a checkered flag. I feel like something is missing on this panel– yet nothing embellishment or stamp-wise really worked. And I didn’t want it too cluttered or competing with the sign post. So it is what it is! 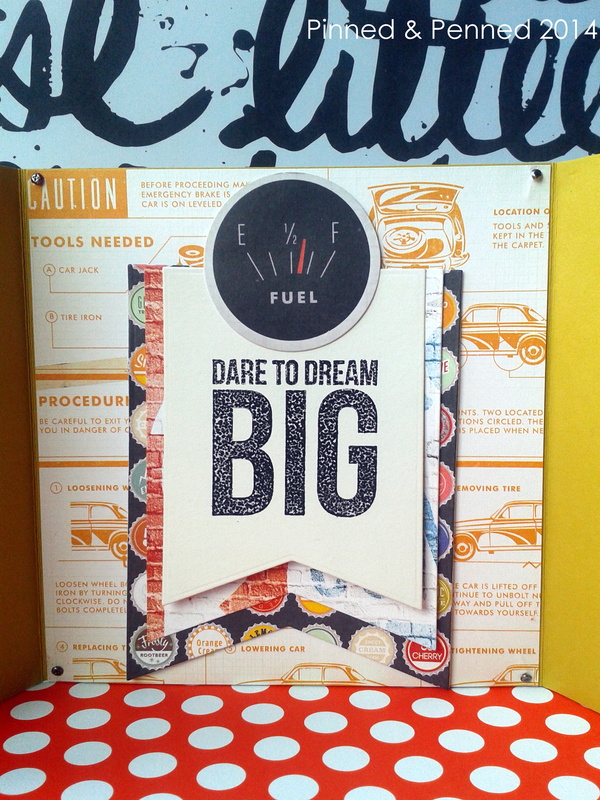 And speaking of something missing– here is the before picture of the card– before I added my Savvy banner. I just kept looking at the card and the right panel didn’t feel right. I wanted to keep it masculine, and Savvy is definitely not terribly masculine, but the little flags seem to work okay. 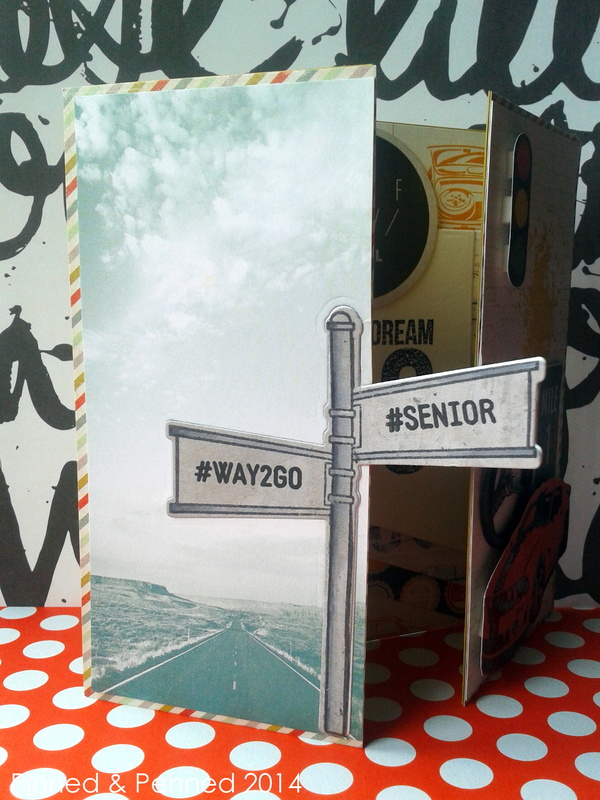 They, too, are cut from Road Trip paper. 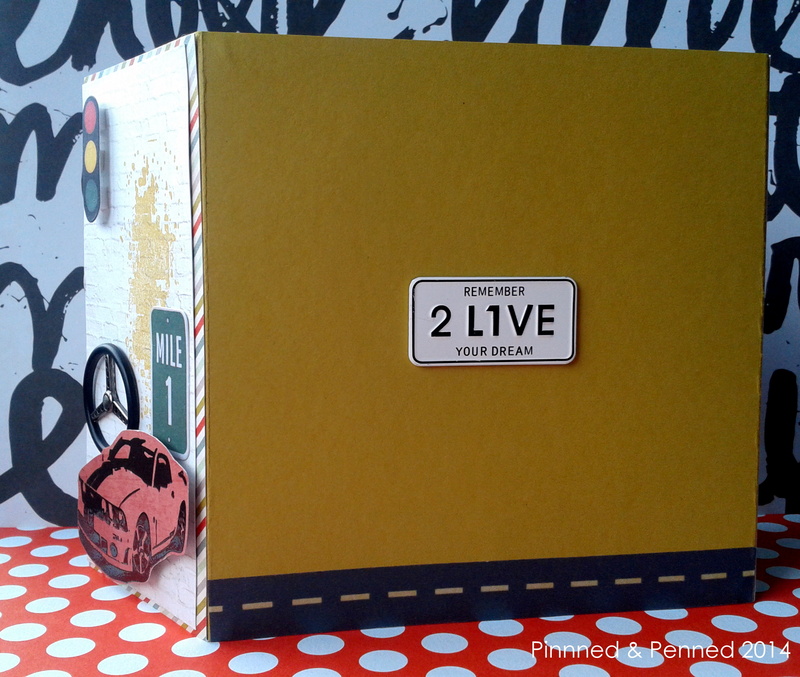 And here we are at the end of the road– a little Prima license plate and fun washi. The base paper is MFT Fuse Green, which worked really well with the colors of the card. So this is headed out to a student who has started an automotive program this fall. Great work Kate! Like the Mustang choice. The blue oval (Ford) has been a fixture with us a long time! awwwwww…how sweet, comment from your mom & dad…that’s totally awesome. 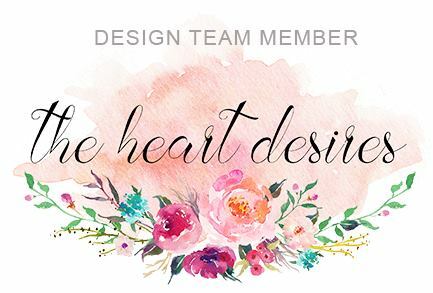 Your card is amazing…all the work and thought that went through it! Wow! So much detail and thought in this card, with an amazing result! you are such an amazing writer Kate, I love your descriptors! This card is fabulous, the receiver is a lucky one! Hugs!